In real life I don't begin every sentence with "Well..."
Well, you may recognize the smaller kid, Moises, from his role in "Nacho Libre". I didn't recognize him at the time, but I wish I had. Na-CHOOOOOOOOOOOOOOOO! Most of the rendered shots of Mater are done by Carlos Baena or other animators. They only show one of mine, which is on the monitor. That's "menv", Pixar's proprietary animation software on my workstation. Dig my rainbow-colored spreadsheet interface! Luckily my real workstation has a much larger monitor. Note the second monitor on the left which has its own computer (called a "xenon") dedicated to playing back Quicktime movies. I improvised the line about "The eyes are the windshield to the soul". Oh yeah, I'm that good. Bravo Victor, you did well! :) I had a blast going through it a second time, note by note. So I take it, you've already seen "Nacho Libre"? It's hilarious. Loved the scene where he's playing with the band at the party lol. It's on my desktop. Lol! Nice interview Victor. That is pretty cool that you have a computer dedicated to playing back Quicktime movies! Awesome! I am going for my 6th screening of Cars this week. Are you able to post a list of shots you did? Ha! Fun. Hey, does menv mean anything? It's just to weird not to and I'm a curious cat. LOL!! i guess that reconfirms that you guys spend 3 to 5 seconds roughly a week!! quality takes time!! great stuff and thanks for sharing!! ps. thanks for the link !!! 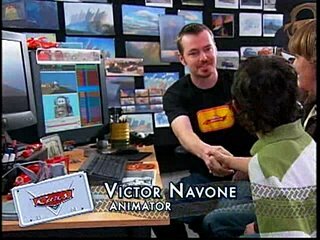 Hi, Victor, thanks to share your good interview, here in Portugal was impossible to see in other way...you made us believe the computer animation is so simple...Unfortunately, it was very short...we want more from you, perhaps in the DVD...(attention, Pixar people! )?Love it! No, I think they're standard PhotoJPEG compressed, which is good for frame-by-frame playback without too much artefacting. Hey, you have really good "screen presence". At least every other word wasn't Errr or Ummm right? Doing anything in front of camera is really tough if you don't do it everyday. The QuickTime playback is interesting. Wonder why movies aren't played back as image sequences and is there QuickTime playback on Linux or is that monitor driven by a Mac. I know that I personally will convert image sequences to QT movies because they are more portable, perhaps this is the reason. 3 to 5 seconds a week for this particular shot but you are working on more than one shot at a time right? So you might be completing 3 to 5 seconds for one shot and 2 seconds for another shot and maybe some on other shots? Is this correct? To answer sugartastic's question, I believe "menv" is short for "modeling environment", though it is no longer used for modeling. I think the name is a hold-over from back in the 80's when they first developed the software. If you watch to the end of the credits of our films it says "animated in 'Marionette'", but no one at Pixar ever calls it this. That's just a name that PR came up with. Answering wesvasher's questions: They might be images sequences that get exported as Quicktime movies. I don't know all the details. PhotoJPEG compression is the standard they decided works best for editorial and all the other departments. You can play Quicktimes on Linux boxes, though not h.264 encoded movies. The Xenon boxes run Windows NT, I think. No, just 3 seconds a week for one shot. Our department average is 100 frames per week per animator. That's why it takes us about a year to animate a film. Thats really cool victor! I'm jealous that those kids got to mess with menv before me! I definitely remember this after the ABC showing of "Toy Story". Congrats on the interview. It was quick, but it went very well. Just like the great Nacho Libre said, I hope the DVD extras will be "especially delicious".